Copyright © 2010 SVJ Designs, LLC. All Rights Reserved. This theater has not provided ticket pricing information. Please see the Help document How Much are Tickets? for more information. Ticket pricing may be found on the theater's official web site. If you are a theater manager and would like to offer this valuable service to your customers, please see the Theater Services section of our Business Information. If you are a customer and the theater(s) you patronize don't offer this feature, please ask the manager there to sign up for this great service! This feature is intended for our readers to share the ticket prices they have found at theaters. This is not a forum for general comments about a theater (for those, look at the Reader Comments page). If you had a problem at a theater, we encourage you to contact that theater using the information on their Contact Information page. Most theaters are very interested in hearing feedback from their customers. Please Note: These reports are submitted by the readers of The BigScreen Cinema Guide and represent their own personal experiences. As such, we cannot verify the information reported below. If you have discovered different information, please submit your own report! Theater Ticket Pricing Information is just one of the services that The BigScreen Cinema Guide offers to theaters. All theaters are able to participate in this service, but not all choose to do so. Ticket prices are subject to change without notice. These prices are a snapshot of the ticket prices as of the date mentioned above, so please verify ticket prices on the day of attendance if the exact price is very important to you. Most theaters adjust their ticket prices yearly or twice yearly, so if the date above is more than 6-12 months ago, there's a good chance that the prices have changed. If you notice that the ticket price information for this theater is inaccurate, please Add Your Ticket Price Report and let us know! 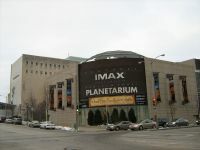 This movie theater is near Milwaukee, Glendale, West Milwaukee, W Milwaukee, Whitefish Bay, Shorewood, Wauwatosa, Bay View, West Allis, Greenfield, St Francis.